Miami's finest point of view may be found from this 51st floor penthouse at the newly opened Paraiso Bay, the first building to open at Paraiso District. 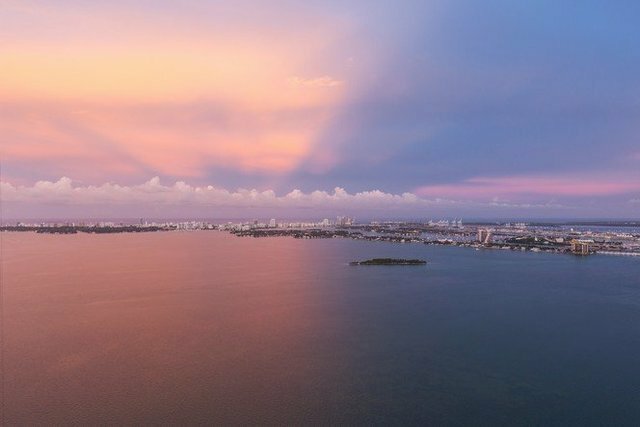 A private elevator entry transports one into a sky-high residence with show-stopping panoramas of Biscayne Bay, Miami Beach, Downtown Miami and beyond.The perfect getaway or family home, #5104 is comprised of four bedrooms, four baths, one half bath, open litchen and laundry room. And for your cars and extras #5104 comes with four assigned parking spaces and two assigned storage units.Abundant amenities include: swimming pool overlooking Biscayne Bay, fitness center, wine tasting room, social room (with four TVs, kitchen and two pool tables), business center (with conference table), screening room (theatre), bowling alley, tennis, Amara at Paraiso by James Beard Chef Michael Schwartz and Paraiso Beach Club.The Paraiso District is located just south of the Julia Tuttle and the Miami Design District, east of Biscayne Boulevard adjacent to Biscayne Bay. Its centrally located within minutes from the Miami International Airport, Miami Beach, Lynwood and Downtown Miami.